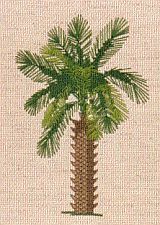 The Palmetto Tree is an attractive plant of the coastal areas of the Carolinas, Georgia and Florida. Classified by the U.S. Department of Agriculture as Inodes or Sabal Palmetto, it is often called the Cabbage Palmetto. Commonly used as a decorative tree, its large leaf bud was prized as a salad vegetable for use in making pickles and relishes. In Florida, it takes many years for this tree to attain its full growth, some uses are considered wasteful since the tree is destroyed in the process.